ATP-Autoteile - Autoersatzteile & Zubehör. 180 days right of return. Suitable for all models mentioned in the vehicle list! 4x Eibach Lowering spring - Pro Kit set E10-85-002-09-22. 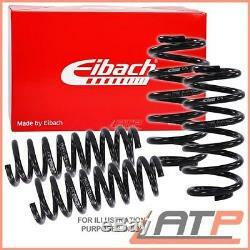 The Eibach Pro-Kit is the ideal solution for your car. Pro-Kit lowers the center of gravity of your car, reduces squats when accelerating, body rolls when turning and nose dives when braking. In combination with the proper wheels and tyres, Eibach Pro-Kit is the guarantee of success for an optimal performance. Pro-Kit also reduces unnecessary clearance between the tyres and the wheel housing, giving your car a sporty appearance. Every Eibach Pro-Kit is designed by our suspension engineers and testing specialists in order to combine a sporty appearance and high performance without compromising safety or ride quality. Before purchasing, please check the maximum axle load of your vehicle. QUALITY PRODUCT - NEW - READY TO FIT. By saving consumables like paper and ink/toners valuable environmental resources are protected. In addition, you do no longer have to make the effort to store, file and look for your invoice. Please note the restrictions on the following vehicle models. 11.00 - 05.05. [mm]: 30 Position: Front axle Position: Front axle or Lowering ca. [mm]: 30 Position: Rear axle Lowering ca. [mm]: 30 or Position: Rear axle Lowering ca. Position: Front axle Position: Front axle Position: Rear axle Lowering ca. [mm]: 30 or or Position: Rear axle Lowering ca. Position: Front axle or Position: Front axle Lowering ca. 12.03 - 05.05. Position: Front axle Position: Front axle or Position: Rear axle Lowering ca. Position: Front axle Position: Front axle Lowering ca. [mm]: 30 or Lowering ca. [mm]: 30 or Position: Rear axle Position: Rear axle Lowering ca. 5 LITRE CASTROL EDGE TITANIUM FST 0W-40 A3/B4 ENGINE-OIL MB 229.5 ###QUALITY BRANDS PROFESSIONAL CAR PART SUPPLIER###. 1x 500ml PRESTO POWER BREMSENREINIGER BREMSENSPRAY ENTFETTER SPRAYDOSE KFZ PKW #MARKENQUALITÄT VOM KFZTEILEPROFI - VERSAND AB LAGER#. 1 L LITRE CASTROL EDGE TITANIUM FST 5W-30 C3 ENGINE OIL ACEA C3 ### QUALITY BRANDS PROFESSIONAL CAR PART SUPPLIER ###. 1 L LITRE CASTROL EDGE TITANIUM FST 5W-30 LL ENGINE OIL ACEA C3 ### QUALITY BRANDS PROFESSIONAL CAR PART SUPPLIER ###. 5 L EDGE TITANIUM FST 5W-30 LL OLIO MOTORE VW 504 00 / 507 00 ### QUALITY BRANDS PROFESSIONAL CAR PART SUPPLIER ###. 5 L EDGE TITANIUM FST 5W-30 C3 ENGINE OIL ACEA C3 ### QUALITY BRANDS PROFESSIONAL CAR PART SUPPLIER ###. Our service - Your advantage! All items have been quality tested. Almost all of our suppliers have been certified in accordance with DIN EN ISO 9001:2000. Ceaae7e9b ce98d9d24 c2849c42e cdfbceb60 c4d5c360d. Huge product range for all makes. More than 800,000 parts on stock 24/7. Genuine new parts by all renowned manufacturers at the lowest prices. Do you need another item? Discover our huge product range in the.. The item "EIBACH PRO KIT LOWERING SPRINGS 30/30 MM (4 PCS) VW PASSAT 3B 3BG 00-05" is in sale since Thursday, April 27, 2017. This item is in the category "Vehicle Parts & Accessories\Car Tuning & Styling\Performance Suspension\Lowering Springs & Kits". The seller is "atp-spareparts" and is located in 92690 Pressath.